Author’s Note: This excerpt covers events that occurred during the 1942–43 opera season. It is understood that some names may be unfamiliar to the reader because their introduction takes place at an earlier point in the biographical text—those of certain singers and music critics, for instance; that of Predrag Milanov, Zinka’s husband; that of Milan Herzog, her childhood playmate who also emigrated to the United States in the late 1930s, and so forth. However, for the most part, the excerpt stands very well on its own. Caveat: the program available for this document did not include the possibility of putting certain diacritical marks in place on names of Yugoslav origin. There should be an acute accent on the final ‘c’ of the name Mestrovic [Meh-straw-veech]. There should be a hacek on the second ‘s’ in the term Ustase (the Croatian Nazi/fascist movement) [Oo-stah-sheh]. Neither of these diacriticals is possible with the currently operative program. Desperately necessary wartime fundraising efforts continued to occupy a great deal of Zinka’s time and emotional energy. On 10 December 1942, the eminent American sculptor Malvina Hoffman hosted a late afternoon tea at the headquarters of the United Yugoslav Relief Fund, 11 West Fifty-seventh Street, and designated the soprano honorary chairman as well as guest of honor. Hoffman, now both friend and admirer, first met and heard Zinka sing while living and studying—with the distinguished Croatian sculptor Ivan Mestrovic—in Zagreb in the late1920s. The tea was in conjunction with the Yugoslav Christmas Bazaar, given under the auspices of the New York chapter of the American Friends of Yugoslavia, one of Zinka’s many memberships that was not cited in the FBI’s laundry list of her “questionable associations.” (Hoffman chaired the New York chapter.) Proceeds from the bazaar, at which Zinka was able to make several surprise “in person” appearances because the event went on through Christmas, were given to the Fund. Publicity ran high, with the recently widowed Edith (Mrs. Wendell) Willkie, Hoffman, and Zinka photographed for all the borough’s newspapers assembling packages together that would be sent by the Relief Fund to Yugoslav prisoners of war. For Mmes Milanov and Hoffman, the concern and activism were by no means academic. Anti-Axis sculptor Mestrovic, being opposed to Italy’s territorial designs on Dalmatia and having snubbed an invitation from Hitler to come to Berlin in the 1930s, was briefly imprisoned by the Ustase, a matter of personal concern to his American former pupil. Only Vatican intervention made his release possible, his prominence prompting actions that led to his survival. Zinka, of course, was worried to death about her family, particularly her father, and had no way of knowing who or how many among her old friends and relations might now fit the designation P.O.W. She had to live with the logical concern that not all could have escaped the ordeal. Trading on her reputation and that of Mestrovic to spur contributions, the Fund sought two million dollars for medical supplies and packages for invalids to be sent through the International Red Cross to the 165,000 Yugoslav prisoners in Germany and Italy. An unpublicized event of profoundest personal significance also transpired on 10 December 1942: in the late morning of that exceptionally busy day, Zinka and Predrag took out their “First Citizen” papers and gave sworn declarations before a Manhattan district court judge of their intentions to become American citizens. (1) “This was very difficult step in that time. I loved my country very much, but I also loved United States. We could not know what will happen with the war, will we ever be able to go home, will Nazis conquer Yugoslavia or be conquered, could it happen that we could be forced to leave America because we were not citizens. Some good American friends were very worried for my situation, that I was not, as they said, fish or chicken [neither fish nor fowl] in New York, that in many ways to be not a citizen was becoming more and more a disadvantage for me. And so we decided.” This at least put the possibility of citizenship in the pipeline, creating an intention that could be referenced at any time lack of the official status became a barrier in daily life. However, acquiring citizenship was not a process that moved with any kind of alacrity during wartime, in particular where those from “problem” nations were concerned. The unpredictable Edward Johnson, having hurried to get Zinka back before the public thrice in the season’s first eleven days, then kept her under wraps for more than five weeks. While this may in a certain way have enabled her fundraising activities to proceed unimpeded and given her needed time to deal with Predrag’s deterioration, such assistance was hardly deliberate on the part of Johnson, who showed scant respect for the Metropolitan’s public by declining to schedule her even once during such a long period when she was in town and available. Still, something special was in the offing. She may have had her hands full at home, but no amount of personal tsoris could stanch the yearning for the release inherent in catapulting her top B-flat out into the huge space of the Metropolitan and enjoying the ardent feedback of the public. That opportunity presented itself at last on 9 January, when she made what amounted to a “second return” in the first staging of Verdi’s Forza del destino in New York since 1935 (when Rethberg was the Leonora). No small part of Zinka’s joy in this development was the fact that she would finally get to sing Verdi again with Maestro Walter. Prior to the commencement of the official rehearsal period (still very short at the Metropolitan, even for a grand revival) and private sessions with the great German conductor, she worked on the score assiduously with a fortyish, Italian-born, Philadelphia-raised repertory coach named Ettore Verna, who had been strongly recommended by no less than Maestro Toscanini. Verna’s studio at 130 West Fifty-sixth Street was frequented both by established professionals like Zinka—Grace Moore was another—and an unusual number of talented younger singers, many of whom were beginning to make careers and reputations right around this time. Though an expert on voice and vocal repertory, Verna was hardly a pianist. Someone else always had to accompany his sessions with singers, leaving the charismatic instructor (including his hands) free to interact with his charges in an immediately physical way and to coax by whatever means possible the ultimate in artistic expression from them. Bruno Walter had conducted Verdi all his life—Zinka’s debut under his baton in Vienna had been in Verdi—but the Forza constituted his first time leading one of the composer’s works in New York. It may also have been the first time he was ever in charge of the opera itself anywhere: “It is impossible to know with absolute certainty whether Walter conducted this work earlier in his career, where documentation is still spotty; but in all likelihood this was indeed his first performance of Forza.” (4) It is possible “to know with absolute certainty” that this was Zinka’s first performance of Leonora di Vargas, the role she had so coveted seven years before in Zagreb. Unquestionably, “la forza del destino” itself had both caused her to miss singing it then and to have Walter for her conductor when she finally got the opportunity to perform it. The maestro used the common German emendation (attributed to Franz Werfel) of placing the overture, one of Verdi’s most rousing, between the opening scene in the Calatrava palace and that of the inn at Hornachuelos. He conducted as if he had lived and breathed Forza for years, and that is exactly how his prima donna sang it as well. 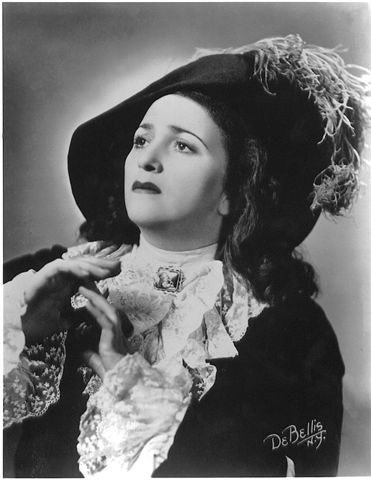 at the time of her first-ever assumption of the role of Leonora in Forza del destino, at the Met in 1943. Most of her colleagues came in for praise as well (if not quite as purple), principally Pinza. The only member of the cast to have sung his role previously with the company, his “noble portrayal of the serene but consoling abbot” was admired anew. (7) The irresistible Irra Petina as the camp follower Preziosilla fit ably into what Kolodin called Walter’s “ensemble of the first order,” and Baccaloni “did one of his characteristic feats in transforming Melitone from a small part to merely a short big one.” (8) The tenor on this occasion was “that dreadful Baum,” the man Zinka thought she’d never have to sing with again when she came to America. “Czech by birth, German by training, an Italian tenor by inclination,” (9) Baum had followed her to the States in 1939, another Jewish musician escaping inevitably unspeakable circumstances where he was living. Still a leading artist in Prague at the time of the Munich Pact in September 1938, he got out before Hitler invaded Czechoslovakia in March 1939, then made his way in stages to southern Europe, ending up in Monte Carlo. Heard there and offered an engagement by Paul Longone, director of the Chicago City Opera Company (operative title of the organization then performing opera in Chicago), Baum made his American debut in the Windy City on 2 November 1939 as Radamès opposite the Aida of Rose Bampton. (10) He was almost forty. (11) The Metropolitan didn’t welcome him until the season of 1941–42, the one preceding that of the Forza revival. The one artist who should have been replaced for the airwaves was of course the very one who could not be. Tibbett’s relationship with Johnson, with whom he had sung in many a historically important Met performance, was too close and extended too far back. Having accepted the erroneous premise that his old colleague could add Don Carlo to his repertory at this point in his life and sing it acceptably, Johnson could not deny Tibbett the broadcast any more than he could have given the premiere to someone else. But Warren, who sang the role for the first time in his career in the third Forza, on 11 February (when Milanov and Baum were back in their original places, Johnson’s revenge having been exacted), was now very much Tibbett’s superior as a vocalist. Particularly stunned by Johnson's apparent stupidity was Jarmila Novotna, who of course was Czech. It negatively colored her relationship with him ever after she heard about it. At a dinner party at Licia Albanese's forty years later (27 May 1983), Jarmila and I were seated next to each other. She, sharing various reminiscences, related the story of Edward Johnson's unforgivable gaffe in telling Zinka where she could go if she wasn't content at the Metropolitan. Great was her surprise, to put it mildly, when I told her that Johnson's reference had not been to Zinka's own nationality but to the fact that he first heard her and signed her to a contract in Prague! For the time being, Johnson remained the perspicacious businessman. Whatever his private thoughts about Mme Milanov—and they cannot have been pleasant—he wasn't going to put the Met in the position of trying to get along without her as it had been necessary to do the previous season, or of trying to persuade Maestro Walter that the available alternates for her roles (no longer including the departed Rethberg) were of equal ability. He did enjoy one final, none-too-subtle bit of vengeance for having been manhandled in her dressing room, however. He simply separated Zinka and Forza permanently, for he returned the opera to the repertory the following season (its last during his administration) and assigned every performance of it, including another broadcast, to Roman.
. 1. “Subject [ZM] filed Declaration of Intention for United States citizenship in United States District Court, Southern District, New York City, 12-10-42.” (This from FBI document part of File No. 100-30413 RCF within INS consolidated File #7579581 dated 8 June 1945.) A similar note appears in PM’s FBI file.
. 2. Erik Ryding and Rebecca Pechefsky, Bruno Walter: A World Elsewhere (New Haven and London: Yale University Press, 2001), p. 283.
. 4. Ryding and Pechefsky, endnote 62, p. 455.
. 5. Jerome D. Bohm, New York Herald Tribune, 11 January 1943.
. 6. Douglas Watt, New York Daily News, 11 January 1943.
. 7. Ryding and Pechefesky, p. 285.
. 8. Kolodin, p. 439.
. 9. Ibid., p. 434. 10. Longone himself never heard Baum, or anyone else again, in Chicago. He died suddenly during his 1939 audition trip, in August in France. 11. Though on 15 March 1989 he claimed to be celebrating his ninetieth birthday, the Social Security Death Register gives Baum’s date of birth as 15 March 1900. There is confusion regarding his date of death as well, several sources giving it as 27 December 1989 when it was in fact 4 December of that year. 12. Noel Straus, New York Times, 10 January 1943, quoted in Ryding and Pechefsky, p. 285. 13. Bohm, Herald Tribune, 11 January 1943. 14. Straus, Times, 10 January 1943. 15. Ronald Toutz, who studied with Baum in New York in the 1970s, recalls the story of that first Met Radamès, undertaken at short notice without any kind of rehearsal at all, as being one of the old tenor’s most frequently repeated career anecdotes. 17. Ryding and Pechefsky, p. 283. 19. Anna Kaskas, interview by the author, 4 October 1994. 21. Max Rudolf, interview by the author, Philadelphia, 28–29 May 1989. 22. Mary Jane Phillips-Matz, Leonard Warren, American Baritone (Portland, Ore.: Amadeus Press, 2000), p. 182. 23. Martinelli and Tibbett last sang together on 4 December 1941, as Otello and Iago. 24. Martin Mayer, The Met: One Hundred Years of Grand Opera (New York: Simon and Schuster, 1983), p. 151.